This is an excerpt from Applied Sport Management Skills, Second Edition With Web Study Guide by Robert Lussier and David Kimball. Plans are either standing plans, which are designed to be used repeatedly, or single-use plans, which are designed to be used just once. 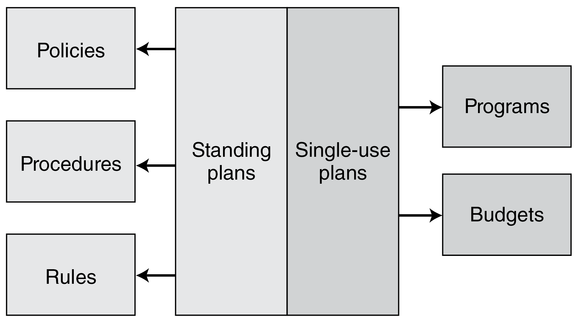 Figure 14.1 gives the different uses for standing and single-use plans. Standing plans are the policies, procedures, and rules for handling situations that arise repeatedly. These plans save everyone involved valuable time because the plans are used over and over, and they guide future decision making. Standing plans, properly used, help organizations meet objectives. Thus, achieving employee adherence to the policies, procedures, and rules contained in standing plans is critical for successful coordination and functioning within organizations. Policies are general guidelines for decision making. They provide guidelines in implementing strategies.26 Policies exist at all levels of organizations. Boards of directors develop broad policies, with the input of top management, for the entire organization. Managers then implement these policies. In doing so, they often establish more detailed policies for their own work groups. External groups such as governments, labor unions, and accrediting associations also dictate certain policies. Examples of typical policy statements are “We promote qualified employees from within” and “Employees will receive due process in grievances.” Notice that policy statements are intentionally general—managers have much discretion in how they implement policy. As a manager, your daily decisions will be guided by policies. It will be your job to interpret, apply, and explain company policies to your team. Procedures (also called standard operating procedures and methods) are sequences of actions to be followed to achieve an objective. Procedures are more specific than policies; they entail a series of decisions and may involve more than one functional area.27 For example, to meet a client’s needs, the personnel from sales, accounting, production, and shipping may follow a set procedure. Procedures ensure that recurring, routine situations are handled in a consistent, predetermined manner. Large organizations typically develop procedures for ticket sales, purchasing, inventory, grievances, and so forth. Rules state exactly what should or should not be done. In addition to the company, the government and sport organizations such as the NCAA develop rules. As you can see from the following examples, rules do not allow for discretion or leeway: “No shoes on the ice.” “No smoking or eating in the locker room.” “Helmets are required on the field.” Rule violations tend to be unethical and illegal activities.28 Violations of rules involve penalties that vary in severity according to the seriousness of the violation and the number of offenses. As a manager, you will be responsible for establishing and enforcing rules in a uniform manner. Policies, procedures, and rules are all standing plans. They differ in terms of their scope—policies provide general guides, procedures set a sequence of activities, and rules govern specific actions—but they all guide behavior in recurring situations as controls. It is important that you distinguish between them so that you know when you can do something your way and when you cannot. Single-use plans include programs and budgets that address nonrepetitive situations. Single-use plans, unlike standing plans, are developed for a specific purpose and most likely will not be used again in the same form. However, an effective single-use plan may become a model for future programs, budgets, or contracts. The plan for building the new Yankee Stadium was a single-use plan, which also required controls. Nike had to plan for the 2012 Olympics by increasing inventory of selected items related to this one-time event.29 But the plan was based on prior Olympic game plans. A program describes a set of activities designed to accomplish an objective over a specified period, which can be short (days, weeks, months) or long (years, decades). Programs are set up for objectives as varied as developing products, expanding facilities, and taking advantage of new opportunities in the environment. When you’re developing a program, you will follow these steps: (1) Set broad program objectives; (2) break the project down into specific objectives and goals; (3) assign responsibility for each objective and goal; (4) establish starting and ending times for each objective and goal; and (5) determine the resources needed for each objective and goal. This process is illustrated later when we discuss planning sheets. We examined budgets in detail in chapter 13. The following definition will suffice for our purposes here: Budgets are the funds allocated to operate a department or program for a fixed period. Budgets are crucial tools in both planning (they help you develop realistic plans) and control (they help you assess how implementation is going), and you need to operate within your budget.30 One of Stu Greene’s most important responsibilities is to ensure that the Maccabi Games are within their budget. No matter how effective your plan, there will be times when things go wrong.31 Maybe the computer on which all the ticket information is stored goes down or your star player is sidelined for the season because of injuries. Just the fact that something is uncontrollable doesn’t mean it is not foreseeable. Effective managers have contingency plans for just such situations. Contingency plans are alternative plans that can be implemented if uncontrollable events occur. So you need to have contingency plans,32 which are also called scenario plans.33 Wise coaches and managers take great pains to develop backup players and employees who will be ready to step in should a first-string player or employee be sidelined for any reason. For example, MLB managers keep close tabs on promising minor league players, who are their contingency plans for sidelined players. How can I prevent it from happening? If it does occur, what can I do to minimize its effect? Pose questions 1 and 2 to everyone involved. Your answer to question 3 is your contingency plan. It is also a good idea to talk to others both inside and outside your organization who have implemented similar plans. They may have encountered problems you haven’t thought of, and their contingency plans can serve as models for yours. Stu Greene notes that by far the most common reason managers don’t plan is lack of time—this is one reason he makes sure to allot time for this all-important activity. Unmet objectives: Deadlines, delivery dates, and schedules are not met. Continual crises: Every job is a rush job, and overtime is overused to complete jobs. Idle resources: Physical resources are idle, financial resources are accumulating interest and not being put to immediate use, or staff are kept waiting for the manager to assign tasks. Lack of resources: Resources are not available when needed. Duplication: The same task is done more than once. Learn more about Applied Sport Management Skills, Second Edition With Web Study Guide.